Wiring a garage is really not all that complicated if you have a basic understanding of electricity and follow widely published guidelines. There is a ton of information on basic wiring principles on the web, as well as a number of great books on the subject, too. You have to be careful with what you find though, especially online, because there is a lot of outdated or just plain bad information out there, too. The National Electric Code (NEC) gets updated every three years. Although there usually aren't many major changes, it only takes one outdated piece of information to cause you to make a costly mistake and put your garage wiring out of compliance! Even with all the information out there, most of it is not specifically focused on a garage. When wiring a garage, especially if it is to be used as a workshop, you have different needs than someone who is wiring up a new bedroom addition. You will likely need more outlets, spaced closer together, and may need higher capacity circuits as well. Garage wiring also has different requirements to meet code - what you would do for a bedroom won't necessarily pass code requirements in a garage. 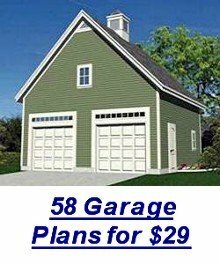 This page is not intended to be a "how-to" guide, but to give you some ideas to think about when planning your garage wiring. I am NOT an electrician, and this should not be considered "expert" advice. I am only giving my opinions and personal experience here, and telling what I personally have done when wiring a garage. Check your local codes, consult with a professional electrician, and use this information at your own risk! Much of what I have here is also going to be specific to wiring a garage in the US and Canada, as many other countries use 240V for regular household current, instead of the 120V we use here in the US. Before starting any garage wiring job, it is imperative that you check on your local regulations. Some localities have different and/or additional requirements above and beyond the NEC. In many places you will have to get a permit before wiring a garage, and some areas require that the final connections be done by a licensed electrician. I recommend getting an up-to-date book on wiring procedures and practices before you start your actual garage wiring plan. One of the most popular books out there at the time of this writing is Black & Decker The Complete Guide to Wiring . At the moment is has a 4.5 star rating at Amazon, with 90 reviews. I have several books on the subject, and my personal favorite is Wiring Simplified . A few folks who wrote a review of that book found it to be a little too technical though, so the Black and Decker book may be a better choice for the average DIY homeowner who is planning on wiring a garage. If you are not sure what you are doing (even after getting one of the books above), by all means consult a professional electrician. A mistake can get you or a loved one killed, or burn your garage (or home!) to the ground. This is serious stuff! - The length of the circuit will affect how much current it can carry and what size wire you should use when wiring a garage. 14 gauge wire is generally only used for 15 amp circuits up to 30 feet. 12 gauge wire can carry 15 amps up to 45 feet, or 20 amps up to 35 feet. These numbers are based on a maximum of a 2% voltage drop; if you are willing to accept a 4% drop you can double those numbers. - According to the US National Electric Code, the safe capacity of a circuit is 80% of the total capacity. That means that a 15-amp circuit should only be used for 12 amps. One amp = 120 watts. Therefore, a 15-amp circuit will safely run 1440 watts. That means that you can put up to 14 one hundred watt bulbs on your 15 amp lighting circuit, or 24 sixty watt bulbs. If you use fluorescent lighting, you can put 36 forty watt bulbs on a single 15 amp circuit. In my standard-size two car garage, I have fourteen 40 watt fluorescent bulbs, and really wish I had a few more of them (the garage doors are in the way, and I just haven't gotten around to adding a fixture in one corner). Each additional bay I add would need six additional bulbs, so for my purposes a single 15-amp circuit could supply adequate lighting for a 5-bay garage. - I recommend putting your lights on a separate circuit from your wall outlets - that way you don't have to worry about killing your lights when you fire up the table saw. - I like to have overhead 4' fluorescent fixtures on each side of the car, in the front and in the back of the car, and over top of any workbenches. A light directly over top of the vehicle will leave lots of shadows if you are doing any mechanical work. - Plan on having a light switch beside every entry door. - Don't forget to plan for outdoor lights for the garage doors and/or entry doors when wiring a garage. - I don't use 14 gauge wire on any of the wall outlet circuits in a garage. 14 gauge wire is only rated for 15 amps for about 30 feet (with a 2% maximum voltage drop). If you run the wire from a breaker box in the center of the back wall, over to the side wall, down the length of a standard garage, and then down to a wall outlet, you have already exceeded the 30' limit. I use at least 12 gauge cables when wiring a garage, even on a 15-amp circuit. Also, that way if I ever want to upgrade a circuit to 20 amps, all I have to do is replace the outlets and the breaker on that circuit. - The more outlets you install, the better! I currently have enough outlets in my 2-car garage to have 28 different items plugged in at once - and there are a couple of spots where it would really be convenient if I had an extra outlet! This is where the double-duplex outlet boxes (4 plug-ins) really come in handy. If you have stationary tools that you like to leave plugged in all the time, and then you need to plug in a portable tool and a trouble light, you run out of spots pretty quickly, even with the double-duplex outlets! I like to install double duplex outlets in several places when I am wiring a garage, mainly where I have stationary tools and/or a workbench. Figure out what stationary power tools you currently have and what you plan on getting in the future. Decide where you want them placed, to make sure you have outlets in the right spots. Remember to include battery chargers that you want to leave plugged in all the time. I like to install an outlet every 8 feet when wiring a garage, even though the "standard" is every 12 feet. - The NEC requires that the outlets in a garage have GFCI protection, either at the outlet or at the breaker. There have been some exceptions at different times, so check on the current code in your area before installing any non-GFCI circuits. - There may be requirements that the outlets in a garage be a certain minimum height above the floor - again, check the current regulations for your area. I personally install all of my outlets more than 36" high when wiring a garage - that way they are above a standard workbench height, and I don't have to bend over to plug something in. Some folks recommend placing the outlets above the 48" mark so you can lean a sheet of plywood up against the wall and still be able to get to the outlet. - Don't forget about the garage door opener wiring! It is better if garage door openers have their own circuit. Don't put them on the same circuit as your wall outlets, although it may be OK to put a couple of lights on the same circuit. 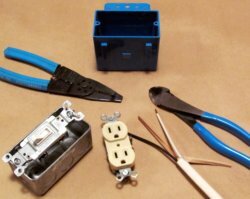 A single 15 amp circuit will probably work for a pair of 1/2 HP openers (depending on the length of the run), but more powerful openers will require their own dedicated 15 amp circuit or maybe a single 20 amp circuit for a pair of them. A general rule of thumb is to figure on 1000 watts (8.3 amps) of demand per 1 HP of motor capacity, but check on the specs for your particular opener(s). If you use your garage as a workshop, I would recommend installing a 240 volt circuit, or at least having that capacity available. There are lots of power tools that require 240 volts - full size air compressors, many welders, and some of the bigger table saws, wood lathes, etc. Most automotive lifts also require 240 volts. Even if you don't have any tools right now that use 240V, you may want to in the future. A standard size bead blast cabinet requires enough air volume that a 120V compressor can't keep up. The 120V welders are limited in capacity. And if you are going to be using a ceiling mount electric garage heater, most (if not all) of them require 240 volts. I have a 240 volt outlet between my garage doors. That way if I need to weld something in the driveway, or want to wheel my small powdercoating oven outside on a hot day, I can do it without using a big, long, and expensive extension cord. And a short extension cord will allow me to reach anywhere I need to inside the garage. I hope these points have given you some new ideas and some things to think about when planning your garage wiring. Make a list of all the power tools and other equipment that you have and/or plan to have in the future. Decide where you want them to be, as well as where you need extra outlets, such as by a workbench or where you will have multiple battery chargers plugged in. Figure in some extra capacity just in case, too. Get a copy of Black & Decker The Complete Guide to Wiring to use as a resource. Remember, if you aren't comfortable working with electricity, by all means consult a professional electrician. Like I said earlier, wiring a garage isn't terribly complicated, as long as you plan wisely and follow established guidelines and practices.